Some of you may be asking me why I took this picture? 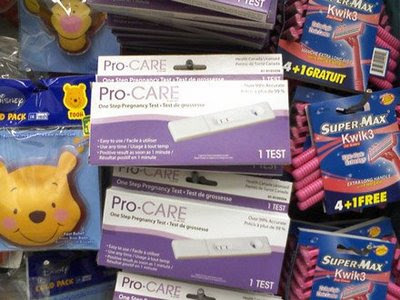 Well, I was at a dollar store over the weekend, and I found it strange that not only were pregnancy tests available there, but astonished by how many they actually had. I didn't think that there was going to be that much demand for them there. And really, who is going to trust a home pregnancy test that you bought for a dollar? That is putting a lot of faith in something you bought in the same aisle as a paint your own wood puzzle kit and High School Musical notebooks (no word of it a lie). Also keep in mind that this is a store that has changed its policies as of late to move away from selling everything for a dollar and now prices can go up to two dollars. And yet, these tests are still a buck. As the store doesn't sell condoms or any other contraceptive devices, well, it is clear that is is far cheaper to find out if one is pregnant than it is to take the means to prevent it from happening (barring abstinence that is), though I figure their condoms would be of the same quality of Chinese manufacture that everything else in the store is. I certainly wouldn't trust a $1 pregnancy test. You'd need to use 10 of them to get an accurate reading, hence, a false economy. God bless the teenage girl who spent her dollar and got a false negative. Planned Parenthood will do it for free. Ray: I could see it being a buck for the ones with the paper strips, but for a pee-on one, that is just ridiculous. Megan: In Canada, a lot of places would do it for free. Spoken like a true woman who has never been through infertility. The EXPENSIVE tests are less sensitive, actually, and the $ tree ones dont kill your wallet after you've been testing for 72 cycles.